"AT SOME POINT I'm gonna be so presidential that you people will be so bored," Donald Trump took to telling campaign rallies and TV interviewers in the spring of 2016. "I'll come back as a presidential person, and instead of 10,000 people, I'll have about 150 people. And they'll say: 'But, boy, he really looks presidential!'" Of course it was never Trump's intention to "come back as a presidential person" — that was the whole point of his smirking declaration. Seriousness and self-control don't fill arenas with pumped-up crowds, and for Trump the crowds have always been the priority. Fifteen months later, is anyone still waiting for the 45th president of the United States to stop acting like a rowdy shock jock? Trump couldn't metamorphose into a thoughtful and levelheaded statesman even if he wanted to. His words are so often obnoxious and juvenile because that is his nature: He is vulgar, boastful, combative, and mean-spirited. He thrives on picking fights, he shows little respect for truth or Constitutional norms, and he relishes the pandemonium his invective triggers. After Trump's crude Twitter attacks on MSNBC's Joe Scarborough and Mika Brzezinski, White House deputy press secretary Sarah Huckabee Sanders was asked whether such insults aren't beneath the dignity of the presidency. Her response: Trump is a "fighter" and cannot be expected to be "attacked day after day, minute by minute, and sit back." Translation: Acting presidential is for losers. Like all presidents, of course, Trump will be judged in part by his policy achievements, some of which may be first-rate. But his coarseness has already dragged the presidency to a sickening new low — and we aren't even one-eighth of the way through the four-year term he was elected to. For months, many of Trump's opponents have warned against allowing the president's thuggishness to be "normalized." Alas, that isn't an option. Americans "normalized" Trump by sending him to the White House. But the degradation of the presidency didn't begin with him. Henry Adams observed tartly in 1869 that Darwin's views were hard to square with "the progress of evolution from President Washington to President Grant." To be sure, Ulysses Grant was no George Washington. But on the whole he served with honor and care, and — here is the key point — he was ennobled by the great responsibility with which the voters entrusted him. That has been true of most presidents, as the framers of the Constitution hoped. In Federalist Nos. 75 and 76, Alexander Hamilton anticipated that, with "great probability," anyone chosen for the highest office in the land would be "a man of abilities, at least respectable" and likely to possess "wisdom" and "integrity." The presidency would tend to bring out the best in a man; once sworn in, wrote Hamilton, a president would "feel himself under stronger obligations" than before, and he would "have fewer personal attachments to gratify." For all their failings, most modern presidents have upheld that standard. Say what you will about their policies and priorities, Dwight Eisenhower, Jimmy Carter, Ronald Reagan, and Gerald Ford did not debase the presidency. 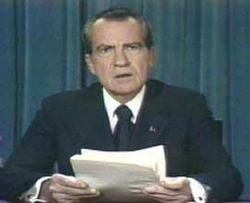 Richard Nixon resigned in disgrace and was shunned by his party. So complete was his repudiation that the honor of the presidency was enhanced. Bill Clinton did. His presidency was riddled with falsehoods and deceit, with reckless private behavior, with contemptible public scandal. Clinton lied under oath and shamelessly abused the privileges of office. Eventually he was impeached, disbarred, and found in contempt of court. Like Richard Nixon, Clinton put the United States through a long national nightmare of outrage and corruption. Unlike Nixon, Clinton never had the shame or decency to admit it. Nixon resigned in disgrace, shunned by his party, and so complete was his repudiation that the honor of the presidency was enhanced. Nixon's fall did a "tremendous amount of good for better government," observed the Watergate special prosecutor, Leon Jaworski. "Those who seek office know there's a very high standard expected of them." But Clinton didn't resign and was never shunned. Democrats, with a few conspicuous exceptions, never stopped defending or at least indulging him. While an army of loyalists savaged the reputations of Clinton's accusers, Clinton himself was treated as no worse than a lecherous, avaricious old rogue. His wife was elevated to the Senate and to the State Department; last year, despite her own glaring ethical shortcomings, she was the Democrats' presidential nominee. The presidency has never recovered from the depravity of the Clinton years. George W. Bush and Barack Obama were not personally corrupt or cruel, but the taint of the Clinton administration continued to hover over the White House. 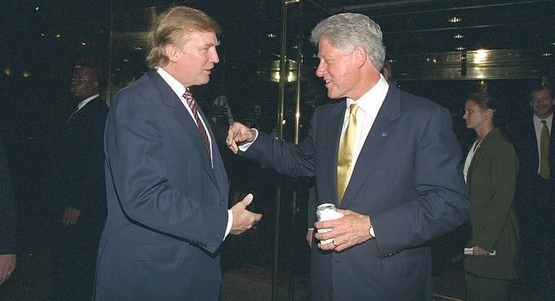 Those who were willing to "normalize" Bill Clinton's infamy have much to answer for. They established a terrible precedent, paving the way for another chief executive of malignant character and a brutal style. Well, now we have one. The Trump presidency is the fruit of the poisonous Clinton administration. And it still has more than 3½ years to run.